“…And yet, across the gulf of space, minds immeasurably superior to ours regarded this earth with envious eyes, and slowly and surely, they drew their plans against us…” H.G. Wells, The War of the Worlds. 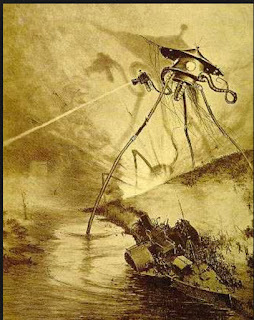 Immediately after The War of the Worlds was first published as a serial in Pearson’s Magazine in 1897, the first of many sequels were published, starting with the quixotic Edison's Conquest of Mars by Garrett P. Serviss, in which Thomas Edison leads an invasion fleet to counter-attack the Martians. Perhaps not surprisingly, a number of authors have written sequels that have tried to shoehorn The War of the Worlds into the alternate history genre. Some have worked out quite well, and some have not. The Great Martian War, a 2013 coproduction of the BBC and The History Channel, for example, is one the former, is an alternate history documentary that had the Martians land in a Europe on the eve of the First World War. The War of the Worlds is not just a favourite science fiction novel of mine. It was my gateway to the literature. So, anyone who comes along with an alternate history sequel, better get it right. 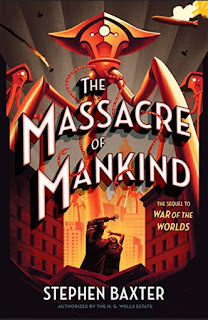 Fortunately, I can report that Stephen Baxter’s The Massacre of Mankind, as both a sequel and a work of alternate history, works on both those of levels and more. Without giving too much away the novel begins in 1920. It’s been 17 years since the first Martian assault on England in 1907, which failed, as we all know, because of the invaders’ exposure to earthly bacteria. Since then, the earth has become an armed camp, watching the skies at each direct opposition of Mars to the Earth for the firing of the massive gun that would signal the renewed onslaught. The British Isles are ruled by a military government, while in Europe something resembling World War One has happened. France is under German occupation and a protracted war with Imperial Russia drags on in the east. While humanity’s technological level may have benefited from the reverse-engineering of what the Martians left behind, the Martians themselves have been learning from their mistakes and have also been adapting. The initial Martian landing in England in 1920 is followed by a second wave which straddles the world. A true war of the worlds then begins, with Baxter not only giving sly but affectionate nods to Orson Welles’ radio broadcast, the 1953 George Pal movie, and a couple of other literary sequels. The book is also a great spot-the-H.G. Wells-reference game as Baxter gleefully slides in references to other works by Wells. Baxter’s novel, “authorized by the estate of H.G. Wells” benefits from his brilliantly-executed plot, its prose, and its cast of characters. While several characters from the first novel are present, such as the “unreliable narrator” of the first novel, now identified as Walter Jenkins, and the darkly pragmatic cockney artilleryman, it's Jenkins’ sister-in-law, Julie Elphinstone, plucky girl reporter, who provides the main narrative focus with a decided 21st Century point of view. This is an excellent novel. Not only is The Massacre of Mankind a worthy and careful sequel to H.G. Wells’ original, touching on many of its themes, while adding a couple of its own, it also stands a superior example of the alternate-history genre. Most highly recommended. I will be reviewing the delightfully zany Gestapo Mars, by Victor Gischler, which is exactly like it sounds.